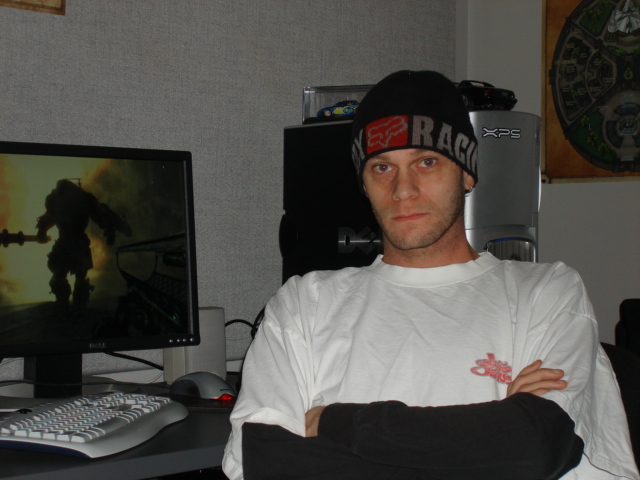 Gary Noonan travaille en temps qu'animateur pour Bethesda Softworks, il a rejoint la société en 1996 et a commencé à travailler sur Battlespire. Par le passé il faisait partie des développeurs les plus actifs dans la communauté, participant au forum officiel et au canal IRC #Elderscrolls. S'il se faisait autrefois appeler Wormgod, il est maintenant connu sous le pseudo de VXSS, finalement il joue le personnage de Divayth Fyr. Il est aussi connu pour être l'auteur de divers Easter Eggs dans Morrowind. Morrowind - World Art & Building & Creature Art and "Special Thanks"
Makes you think though. Was the Ghostfence keeping the bad stuff in.... or was it keeping adventurers OUT. Was it proecting those on the outside, or protecting someone's "precious" on the inside. Who's idea for the Ghostfence was it again? It's mostly personal. Access to Imperial facilities which house documents and such are of great interest. Fyr has a great respect for the throne even though he may not believe in it. Fyr is not exactly an active member of the Telvanni Council. He is more like a consultant or advisor to them. Though, he respects their command and WILL carry out most requests laid down by them. In all, the Telvanni Council and the Imperial Throne are treated quite the same in Fyr's eyes. Fyr is kinda what you could call the Flower Child of Tamriel. The Pocket Guide explains the Khajiit rather well. They basically are one race, but range from very humanoid to perhaps an actual cat-like appearance. You could probably mistaken the most humanoid one for a human, while the most beast-like one you might take as a cheetah or something. This is my best idea/suggestion anyways. The same can probably be said for the Argonians. They may range from either a very humanlike apprearance to a crocodile-like appearance. I guess it depends on how many times they decide to lick the tree (refer to the PGE). Remember, Khajiit come in many forms. The closer you get to their homelands, the more wild they may appear. Though wild looking, this does not mean they are more primitive thinkers. There may or may not be different forms of the Khajiit in MW (I'm not the animator, so I wouldnt know) so just keep your eyes open for them. Also, another point to be taken is that since Dark Elves use Khajiit and Argonian slaves, the nature of these slaves is most likely to be more Kitty-like, or primitive. There are reasons for the look, so dont think that it was just a snap decision. 5) Perhaps in future products, you can have the choice to play different types of Khajiit. Gentlemen prefer Ohmes... although I have to admit I like the way the Suthay-raht (sometimes called ja-Khajiit, though this is either a deliberate insult or a translation error) in Vvardenfell have turned out. 6) If Khajiit have six breasts, which I will neither confirm nor deny, only the top two have visually-pleasing fat deposits in most "beeds." 7) Only three "breeds" of Khajiit have the, um, adaptation discussed in The Real Barenziah which occurs in Earth-cats for entirely different reasons. 8) Khajiit are not like cats in every way. They are not exactly like humans either. I should know because I made all this stuff up. This myth and legend takes place long, long ago, before the Empire was established, and even before the northerners touched foot on Tamrielic shorelines. Elves (Dunmer) were the predominant race of the continent, alongside the much smaller races of beastmen. A traveling band of elves were crossing through a mountainous range in the northeastern region of Tamriel. They encountered a friendly group giants and established relations amongst the two races. The giants had never encountered any human-like races and were bewildered at the small appearance of the elves. The towering giants stood many, many heads over them. The elves of course, were really not too much different in appearance or size than a typical human, but the giants were not aware of this since they had never seen a human. The giants labeled the elves as "Dwarves", claiming that they were just smaller versions of themselves. Over several years, this tag became a widespread label, and these Elves were known as Dwarves. The Dumner translation of the word Dwarf is Dwemer. So, strangely enough, all Dunmer would use the term "Dwemer", while the northerners/newcomers rerered to this ancient race as Dwarves, taking on the translation of the giants. It is unknown, but perhaps the newcomers encountered the ginats before they did the elves. Little is known as to the significance of this legend, but it is told to children all over Tamriel. Many would swear by it while many others will claim it is simply a bogus story. Ok, "according" to the legend, the Dunmer originated from the Dwemer. They WERE once also known as Dwemer. The giants thought they were small people, and so called them Dwarves (just as we call short people midgets and dwarves). After many many generations perhaps, the name Dwarf, or the translation "Dwemer", finally just became the tag. I am not saying that the labeled Dunmer accepted the name, they may have just tolerated it. I mean afterall, to them it just meant "a short person". Remember, they have/had no concept of the D&D Dwarves, so would not think of themselves as being compared to them. It also doesnt make them a different race. They were by no means a different race. This was many many years before the Empire was even a thought, so the Houses didnt even exist back then either. The Dunmer operaterd their race through a network of tribes. When the Dwemer was heard about by other Dunmer tribes, they were considered as another tribe. But, for reasons perhaps unknown (hehehe) to many, this tribe was not accepted by other Dunmer tribes. Many things would occur in the years following the creation of the Dwemer, right up until the disappearance. 1: The environemt is not suitable for horses. The ashy air creates bad vegetation for horses and upon munching on grass and such, they drop dead. Ashgut sounds like a good term for the ash/gastro poisoning. Imagine having charcoal fill up your digestive tract. Cant be a pretty picture, especially when black goo starts leaking from every hole on your body, right before you pop. 2: Dark Elves find horses to be a great dish. The Alpo Bistro! No Imperial guard wants to walk outside his house and see a Dark Elven family picnicking on his steed. The Empire adopted using Guar and Siltstriders since they are more indiginous to the area. In many cases, Guar and Siltstriders are more advantageous than horses anyways. This brings us back to the topic of Vivec and company. Speaking only about Vivec (this goes for his pals of course too), is he REALLY considered a God who lives among people? General Patton swept across a many battlefield, and many think him a great man. But, that doesnt exactly make him a God ya know. In a fantasy setting now, Vivec once did the same. He faught in a great battle and currently uses his "aquired" magics to hold off the blighted forces. More can be learned about him in Morrowind, but from what we "currently" know about him, we cannot trully label him a God can we? Maybe he is no more than a simple hero. *shrugs* Almalexia may be no more either. Just as many (in OUR existense of course) may believe Jesus to have just been a considerate, caring human being. I think its all a matter of personal belief, but interesting all the same. Not to be cruel, but its keeps everything very dynamic and ever evolving. Just because we tell you a red stick is white, it doesnt mean it isnt really green. All opinions are very acceptable and I understand (although I may not agree ) any resentment towards the direction of the evolving TES game world. With all due respect, however, there are TONS of events and such in the TES world that are STILL yet unknown to the general fanbase, yet, most is known to the developers. Of course, things such as slavery of the beast races in Morrowind are not something new and pulled out of the developer compost heap. Slavery was a known issue since Daggerfall, believe it or not. It may not have been an issue in Daggerfall, but it is being used now. Even in the game Morrowind, visiting as a beast race, you are known as an Imperial citizen and are NOT looked at as a slave or a worthy slave. You are treated as any other Imperial citizen. Argonians and Khajiit alike. The fact that you may have played as a beast race in Arena and visited a town in Morrowind would still have nothing to do with the fact that there was slavery. I played extensivelt through Arena years and years ago, and this fact does not at all phase me. It is simply something that I look at now and think, "Wow. I visited Morrowind as a Khajiit in Arena and didnt notice a slave/servant situation anywhere. Wonder why I notice it now in THIS game." Sure, that's a thought of mine, but I accept it. As a gamer, a TES fan, and a developer, I totally agree on the direction things have taken thus far. Of course, with the exclusion of Khajiit and Argonians in Battlespire, I dont know what to say. That was just a design decision. It doesnt mean that they were NOT in the TES universe, it just meant that we did not implement them. Who knows, it may go deeper. Perhaps, at that time, the Imperial Battlemages did not allow beast races to join the Elite Battle college. That's just an idea, not an answer. In all, it was an action shooter. Not a TRUE BEEF TES RPG. On that note, certain different rules had to be applied anyways. With Redguard, you only played a Redguard. Couldnt play another race. Well, another case of "an action/adventure game", so alternate rules applied. Of course, Redguard was the game that initially hinted on at the slavery and multiple beast breeds, so it was a stepping stone game. It was a good build up to the deeper stuff within the TES universe. And trust me, it gets so much deeper that decades of games will need to be made to find out more and more of the dirt within Tamriel. The PGE.... what can I say? Of course, depending on what individual, what race, or what class of character wrote it, it would be biased in some manner. IT IS NOT A TES BIBLE. It was never intended to be. It was a fun little "insight" about "ones" visit to various provinces around Tamriel. I thought it was a fairly informative reading and provided readers with some clues, gossip, myths, and mysteries. It was a sort of Dante's Inferno, so to speak, set within Tamriel. Like when National Gepgraphic goes to the wild rain forests of Peru to study the Madrigal Spider Monkey, we take their word for it that they did indeed study this thing for 4 years, through harsh rains, blistering heat, and monsoons. It did indeed swing from tree to tree as a nocturnal creature. It has a mating cycle much like the chimpanzee. It even has a fairly high intelligence. They then come back to the states, edit this hour long program to bring us an exclusive Ntional Geographic Undercover show on Discovery Channel, and they tell us all they had to learn about this creature. An hour later, the credits roll and we sit and ponder what an incredible find this is, and we wonder just how much they ACTUALLY had correct through their 4 year study. Then, more skeptisism sets in and you realise that NONE of this may be true. This monkey doesnt even exist. This may all be for entertainment reasons. Discovery Channel just won the nightly rating with millions of viewers. Hmmm. Basically, you know deep down inside, you wont believe it unless you could actually see this monkey (do you recall the mammoth that was dug up? funny how we see so little of it, yet we believe). Tjis goes back to the PGE. It "states" many things, but these things are a ploy, perhaps, to get the reader to more involve themselves in the subject and do a little research on their own. That's the way I look at it anyways. So there you have it. My own little Reading Rainbow. But you dont have to take MY word for it. Dragons are not native to Vvardenfell due to the harsh environment. In Redguard, the present dragon is in control of the Empire. Could it be that the existing dragons work with the Empire in return for protection and spoils? If this "were" the case, many dragons probably reside in or around the Cyrodilian/Imperial province. Remember, the symbol of a dragon appears in the Imperial crest. Of course, like in Redguard, they could be dispatched to regions where the Empire needs them. As for Morrowind, there is little protection, if any that the Empire could offer them, especially in Vvardenfell. As for the Skylamps, that's a strange idea that they are natural predators to dragons. If anything, the Cliff Racers may be a natural predator if they attacked dragons in packs, or flocks. I guess the Cliff Racers could be much like the creatures that were in the movie Pitch Black. Not totally, but just in their predatory nature. This could be one theory why dragons either moved out or never existed in Vvardenfell. It is also hinted in Battlespire within a journal and in the remains, that the Imperial Battlemages used dragonmounts for security on the Battlespire. In level 1, you will find the remains of an Imperial dragon names Dragonne Papre' and his rider. The journal contains tidbits about the troubles in the spire and what may have happened so that only their decayed bodies remain. All of the dragons didnt die. They have their own means of remaining "hidden" from Tamriel's populace. Whether its shapeshifting, hiding deep in the mountains or jungles, or even in very protective custody of secret Imperial strongholds, they do exist. The reason the dragons left Morrowind was because of the food chain being broken. Cliffracers were in such great numbers that they food became scarce for the dragons, so they moved on. Even if they stuck around and killed the cliffracers off, the food would still be at a shortage. The dragon from Redguard fell easily for many reasons. Cyrus was more than just a Redguard. Playing the game will explain much about his abilities. Also, no matter big the dragon was, he was confined in a rather tight space. Try wrestling with someone in a box the size of a microwave. Plus, Naffy wasnt the smartest of dragons, as working for Lord Richton should say that much alone. His greed got the better of him. Not such a noble dragon. Also, as Battlespire hinted, there is (or was) an elite Imperial dragon mount guard (TES Dragoons). Search for a document relaying a wing mounted guard's final words about his mount, PaprDragn. Best Westerns. The were basically fortified stronghold/checkpoint/hotels for travelers. There are no records of any of the strongholds ever being held under siege or used in any battles/wars, but it is quite possible that they were used for warriors as layover posts while travelling. La dernière modification de cette page a été faite le 17 mars 2015 à 20:06.